Whats happening this week at SB Freethinkers. Your group can purchase the pamphlet from SIA at their office or at the next assembly. View/download now by clicking below. Welcome to Stony Brook Freethinkers – a secular AA group. Stony Brook Freethinkers is a secular AA group, registered with the General Service Office of Alcoholics Anonymous. Our primary purpose is to stay sober and help other alcoholics achieve sobriety, to widen the gateway to recovery, and to help make AA ever more inclusive. 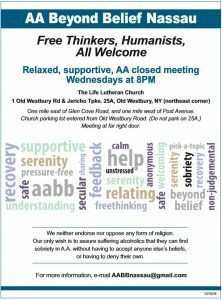 At Stony Brook Freethinkers, we maintain that sobriety is possible to all who enter the rooms of AA, regardless of individual beliefs or lack of belief in traditional deity based spiritual traditions or religions. The Stony Brook Freethinkers group endeavors to maintain a tradition of free expression, and conduct a meeting where alcoholics may feel free to express any doubts or disbelief they may have, and to share their own personal form of spiritual experience, their search for it, or their rejection of it. In keeping with AA tradition, we do not endorse or oppose any form of religion or atheism. Our only wish is to assure suffering alcoholics that they can find sobriety in AA without having to accept anyone else beliefs or having to deny their own. Please explore our site and feel free to send suggestions for improvement to the Web Team. This web site is neither endorsed nor approved by AA World Services Inc. The views contained on this web site do not reflect the views of AA World Services Inc., or any other AA entity, and are the sole expression of the group conscience of Stony Brook Freethinkers. Google and Google-Maps are registered trademarks of Google Inc.